"This stunning dish is an amazing combination of sweet, spicy, and salty flavors all sticking to succulent pieces of chicken." Whisk brown sugar, water, fish sauce, rice vinegar, soy sauce, garlic, and ginger in a bowl until brown sugar is completely dissolved, about 1 minute. Set aside. Heat oil over high heat in a skillet. Stir in chicken. Pour 1/3 cup of the brown sugar mixture over chicken; cook and stir until the brown sugar mixture has a syrup-like consistency, 6 to 7 minutes. Pour in the remaining brown sugar mixture; cook until chicken is tender and no longer pink inside, about 5 minutes. Stir in in peanuts, jalapenos and green onion; cook until warmed through, 2 to 3 minutes. 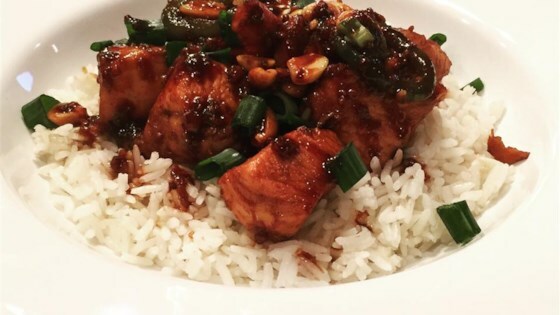 Spicy, sweet, and savory stir-fried chicken with peanuts and cilantro. This recipe was absolutely fantastic! Make sure you watch the video before making it because it's got some crucial things in it.